Rumours of the 12 inch Samsung tablet have been abound for the longest time now. At CES is where we are finally going to see covers unwrapped off the 12 inch device. 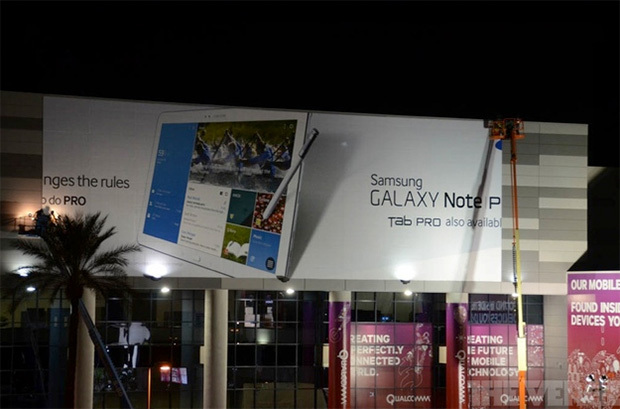 The device which has been tagged with a Pro extention will be two devices, the Galaxy Note Pro and Galaxy Tab Pro. This is according to the billboards that have since been revealed at CES in Las Vegas. The image shows a Galaxy Note Pro with a Stylus and a new UI on the screen that seems to either borrow heavily from the Samsung app My Magazine that comes pre-loaded on the Galaxy Note 3 or the Windows Phone Tiles UI previously called Metro UI. One can also make out the words “changes the rules of what you can do” meaning that the two devices will have strong focus on productivity, it wouldn’t surprise if they come with a companion keyboard, accessories and other connectivity functionalities like ability to interact with numerous other devices. Nothing is out as yet regarding these two devices but they will formerly be announced at Samsung press conference in the course of CES. Samsung had hinted strongly that they will be unveiling several tablets and these to just seem to be part of what to expect within this quarter.